There is no secret to a great decorating job, all it involves is the 3 pï¿½s; Prepare, Prime, Paint. We do not skip any of the preparation and we only use the best sundries for this task. There are a whole array of fillers out there to use but we only use the correct fillers, not the cheapest, so we get the best results. With the priming and painting we only use Johnstone's paint. I have used every brand of paint available in my 32 years of decorating, but in my opinion, none of the others can match Johnstone's paint for quality, durability or value for money. Over the last few years the manufacturing process of paint has changed dramatically with the introduction of the European VOC legislation and Johnstone's are at the forefront of the new acrylic and water based systems as well as the traditional and specialist coatings still required by the trade and public alike. By using Johnstone's you are guaranteed the best quality paints available. But using the correct sundries, preparing the job properly and using the best paint only counts when the paint is applied properly and to the manufacturerï¿½s specification.This is why we work closely with the PPG Extra team. These are highly skilled professionals who can supply us with all the technical advice, specific specifications for the most complex of projects and colour advice or schemes if required. A good decorator can make a poor quality paint seem good, whereas a poor decorator can make the best paint look like poor quality. We make sure we prepare thoroughly, use the correct primers for the top coats needed and always apply the correct amount of top coats for the system specified and with our close working relationship with the experts at Johnstone's, you can rest assured you will get the best job possible. Johnstone's Trade Cleanable Matt is a premium matt emulsion suitable for high traffic areas requiring frequent cleaning such as kitchens, halls, stairs, landings and busy corridors. Highly stain resistant, Cleanable Matt contains technology that helps to prevent stains setting into the coating and allows for easy cleaning; making stains and marks easier to remove without impacting on the finish or colour of the paint. 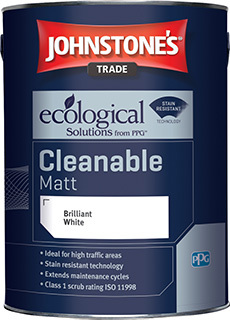 For further information on Johnstone's Trade Cleanable Matt, please visit https://www.johnstonestrade.com/cleanablematt. PPG Industries is recognized and respected around the world as a global coatings leader, providing technologically advanced solutions to meet even the most difficult coatings challenges. From developing a revolutionary coating process for the automotive industry, to providing durable and lightweight protective aircraft coatings, to coloring electronic equipment and consumer goods, to safely lining food packaging, PPG is there to lead the way. PPG Architectural Coatings draws upon the companyï¿½s commitment to coatings research and manufacturing excellence to deliver the latest technology in its wide array of architectural paints. A relentless commitment to the sharing of technological advancements and operational best practices, combined with the acquisition of Akzo Nobel North American architectural coatings business in 2013,enables PPG Architectural Coatings to offer an industry-leading house of strong brands and to be a leading player in all distribution channels. “Right from the start we were impressed by Chris's care for us as his customers. He was determined to provide the effects we wanted. He worked unobtrusively, clearing up as he went. He fitted in with other trades and worked hard to meet difficult deadlines. Nothing was too much trouble for him. Overall it has been a pleasure to have him and his team in the house, and wonderful to experience a traditional 'family firm' working together so constructively and effectively.We were impressed, too, by Chris's close and constructive working relationship with Johnstone's Paints. We felt that he was given, and accepted, the best technical and design advice, which is apparent in both the quality and the practicality of all the paints he used.